Today is finally the day! After almost 5 months, our wedding video is done. I'll start out by saying that when the time came to make the decision about the videography, I was really really lost. I was a few weeks away (short notice, I know!) so the idea of shelling out even more money didn't seem like a very fun idea. I did a bit of surveying and everyone that spent a lot on their wedding video said it wasn't really worth it. I wasn't getting a feeling that it was a must-have item. When the wedding was over, the only thing I wanted to do is look at video coverage of the day. Pictures worked, but I wanted to see everyone, hear the speeches and just watch it all over again and again. That was the big reason that I decided video is very important. Ya maybe I won't watch it ALL the time, but at least I have it to watch again and again, show kids, etc. So I went the craigslist route. I paid a few hundred dollars for a guy to shoot it, and I paid to get it edited. Luckily for me I have a friend, Matt Cross, who is an incredible editor because most videographers won't even touch footage they didn't shoot themselves. And I can see why. The footage we had to work with from the shooter was, well.....not good. Literally you could easily throw away so much of it that you wouldn't be able to actually put together a video. Matt took the footage and worked it like crazy. You can tell he is really passionate about having a great product even when that is really hard to do. Baring in mind the coverage we had, he created this 7 minute video of our wedding. And just in case you missed this: here is Ian's wedding speech. So how did you like part 1 this morning? I am here again with the reception side of our wedding. Let me just saw that there are TONS of details packed into this one. And that credit goes to my amazing planner/stylist Shannon Leahy Events. She took all the inspiration from my head and created something far better than I could have imagined. I couldn't believe the work she and the other vendors (Floral Theory and even my cake lady) to excede every possible expection I could have possibly had for this day. Remember how I said there was a surprise proposal at our wedding? Today is the day we are showing that off! The film is featured on The Wedding Chicks with a few images from our wedding. I'm so excited for you all to see it! 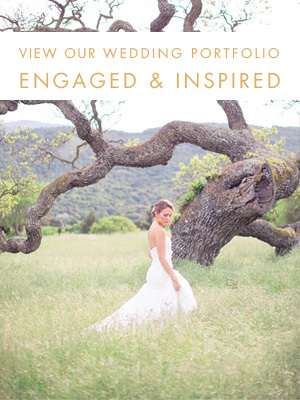 Thanks so much to The Wedding Chicks for the wonderful feature! I have been very hush-hush about these little babies up until now but I am very excited to finally them off. This morning our wedding is being featured on Style Me Pretty! And this is one of my favorite photos from the day. I have to take this chance to thank you to EVERY reader who has supported me, helped me and been there for me during the wedding planning process. There were challenging times and this blog really helped me get through it. And I must give a huge thank you to each and every one of my vendors. IN-CRED-IBLE. That said, Engaged & Inspired is staying right where it is despite the wedding being over. In fact, we are re-designing, re-launching and offering up so many more amazing features, services and ideas than ever ever before. And we will be dishing the dirt on all things our wedding from now on, which I can't wait for. Next week I'm talking table numbers...exciting. Last but not least, OMG is this a big day for me!, we released the deets on The Lab! WOOT WOOT!